I TRIED! I really did, but a long weekend of drinking caught up with me very quickly. I've got one full review in the works, but in the meantime here's 9 (yes nine!) badge reviews. As usual if you want more detailed tasting notes, drop me an email. When drinking a Panhead Vandal I wondered if I'd remembered to check-in the 5 specialty Panhead beers at the Tru Bru tasting the other week; I hadn't. Earle's Revolver was a Smoked beer and had a really good bacon flavour. Drink Like a Kiwi (Level 15) was the badge. I'll be Bock, the badge bearing Arnie's resemblance below centre, took me far longer to acquire than I thought it would. Basically you need to drink 5 Bocks, or any of their sub types Eisbocks etc. Goodieson's Maibock from S.A. was the beer that got me over the line. It was interesting with plenty of bubblegum along with some spicy and floral hops. It's a beer that I certainly would have again. The old 2 badges in one check-in occurred last Monday. I took the most of the public holiday to earn the Liquid Lunch badge, for drink 5 beers in a month between 12pm-2pm Monday-Friday, & the Pale as the Moon (Level 35). The beer was Riverside Brewing's 55, an American Pale Ale that I'd never had before. 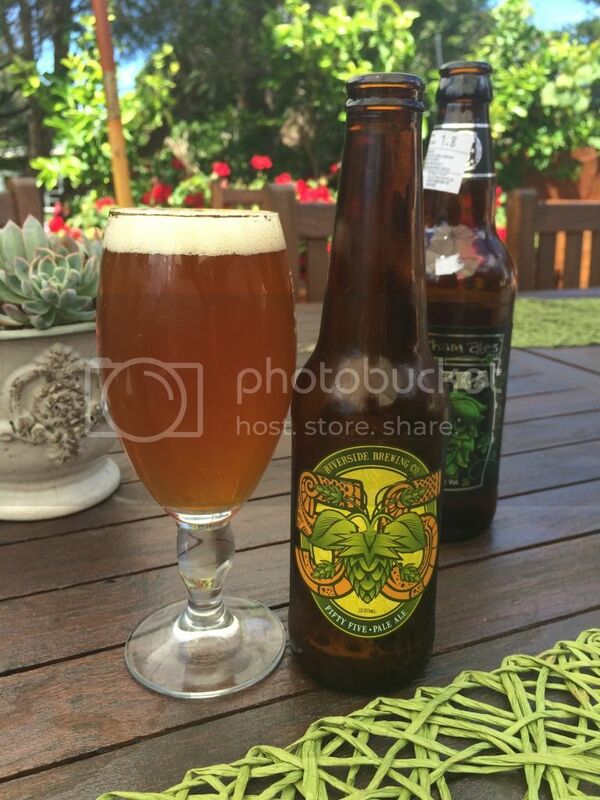 It had plenty of pineapple flavour coming from the hops and went down really well in the sun on the deck! The artwork is pretty cool as well. Another Emelisse beer to earn a badge for me was the Porter. Heavyweight (Level 27) is why we're talking about it. The beer exceeded my expectations, it was an excellent Porter with good roast and creaminess. There was plenty of hops as well, with citrus and some interesting fruit flavours coming through. It drank beautifully, I will be picking up more of these and would advise you to as well if you are into darker beers. I've been seeing alot of the Big Sky IPA tins around recently. They are quite distinctive with orange and yellow on a shiny silver background with a goat on it. It was a really nicely balanced IPA with apricot the dominant flavour. It left you with a slightly dry finish, which really made you wish you had another! Land of the Free (Level 31) was the badge. Regular readers of this blog will be away of my affinity for Imperial IPA's and in particular Sixpoint's Resin. Clearly this is the first time I've had one since the Hopped Up badge has been in place as it earned me Hopped Up (Level 4). It's a brilliant very piney Imperial IPA and one that everyone needs to try! I will refer you to my review from last year for further tasting notes. A mystery Tru Bru bottle in my fridge was confusing me. It was unlabelled (I assume the label fell off) and I had no idea what it could be. I opened the bottle and knew immediately! Delirium Nocturnum! It's a beer I adore, and it's even better off tap! There's plenty of dark fruits and spices as well as a nice caramel malt base. Beer lovers, you all must try this beer! Belgian Holiday (Level 14) was the badge, which makes me really wish my own Belgium holiday (coming up this July) would get here quicker!